Is Manipulation Partly to Blame for Silver’s Plunges? Coming up we’ll discuss the ongoing manipulation of the gold and silver markets with Chris Powell of the Gold Anti-Trust Action Committee. Chris tells us why he thinks the regulators are so powerless, the troubling authority that allows the government to legally rig markets, and what might happen to the metals if and when this manipulation finally comes to an end. Don’t miss a terrific interview with GATA’s Chris Powell, coming up after this week’s market update. Well, this week brought both good news and bad news for precious metals bulls. The bad news is that gold and silver prices broke down from their major consolidation patterns. Based on the technical damage done, the momentum and the short-term trend in precious metals markets is pointing lower until new buying interest kicks in. As you may recall we spoke about how silver was at an inflection point here on the show last week and that we would be looking for a move one way or the other during this the first week of the third quarter. Well, that move came as predicted and it was to the downside. Silver has now given back ALL of its 2017 gains. Gold, however, is still holding onto gains of about 6% year to date. So the good news is that the yellow metal is still in a longer-term uptrend until proven otherwise. The even better news is that the long-term supply and demand fundamentals for gold and silver only get better with lower prices and the likelihood of diminishing mining output. The question for traders, though, is whether silver will bring gold down in the days ahead or whether gold will lead silver back up. Silver prices are close to double bottoming at their lows of last December. Bulls will be looking for that level to provide some support. As of this Friday recording, silver prices come in at $15.70 an ounce, down 5.9% on the week. Spot gold checks in at $1,215, off 2.3% since last Friday’s close. Platinum is down 2.4% to trade at $909, while palladium is lower by 0.9% to trade at $839 per ounce. Earlier this week, the Federal Open Market Committee released the minutes from its most recent meeting. The Fed is still expected to stand pat on interest rates for the rest of the summer at least. But Fed officials are indicating that by September they may finally begin quantitative tightening – gradually scaling down their trillions of dollars in Treasury bonds and mortgage-backed securities. Fed chair Janet Yellen is operating under the assumption that the last financial crisis has been solved, and the conditions that led up to it have been fixed. She even went to so far as to say that we probably won’t see another financial crisis in our lifetime, a rather smug and arrogant sounding claim to say the least. It’s reminiscent of former Fed chair Ben Bernanke’s notorious claim that the problems in the sub-prime mortgage market were “contained.” Shortly thereafter, they nearly took down the entire financial system. Now it’s true that the next financial crisis probably won’t look like the last one, which forced everyone to pay close attention to bank lending practices. No, the next crisis will probably emanate from somewhere else. Perhaps it will be the trillions of dollars in underfunded pension programs that governments and corporations are running. Promise now, pay later. Kick the can down the road. It works for a while. But eventually, the road will reach its end and the unfunded obligations will come due. The state of Illinois alone has accumulated $200 billion in pension liabilities. As of now, it could only afford to pay out about 40 cents on the dollar for its IOUs. Illinois is effectively bankrupt. For the past several months, it has stiffed contractors and creditors. It has fallen behind on its utility bills. State legislators are now moving to raise taxes sharply in a desperate effort to plug holes in the budget. But the longer-term problem of underfunded pensions remains insoluble in Illinois, in most other states, and at the federal level where unfunded liabilities loom totaling more than $100 trillion. Quite simply, the kind of money that’s needed to make governments financially sound again doesn’t exist in taxpayers’ pockets for governments to extract. The only entity capable of generating the trillions of dollars needed to fill the gaps in pension funds is the Federal Reserve. The Fed may try to bail out U.S. pension and Social Security systems stealthily through inflation. But a sudden crisis would require more drastic action. If you are a pensioner or planning to one day retire on pensions and Social Security, don’t count on these programs alone to carry you through into old age. It’s mathematically impossible for every beneficiary to get every dollar they are promised – at least in terms of today’s dollars. As such, hard assets including physical precious metals should have a place in any sound retirement plan. Gold and silver bullion coins aren’t IOUs – and can’t be ruined by inflation. Mike Gleason: It is my privilege now to welcome in Chris Powell, Secretary-Treasurer at the Gold Antitrust Action Committee, also known as GATA. Chris is a long-time journalist and hard money advocate, and through his tireless efforts at GATA he is working to expose the manipulation of the gold and silver markets. Through GATA's work over the years. Some important revelations have come to light, which quite honestly should concern everyone. It's great to have him back on with us. Chris, how are you, and thanks for taking the time to talk with us today. Chris Powell: Great to be with you Mike. Mike Gleason: Well it's been more than a year since the last time we had you on, and there actually are some developments finally in the whole precious metals manipulation realm, specifically Deutsche Bank coming under fire for rigging gold and silver markets. Talk about this Chris, bring us up to date here on the whole lawsuit, and then give us your thoughts on whether or not this is going to finally get us somewhere on ending the manipulation that has occurred in the precious metals markets for years, if not decades. Chris Powell: Sure Mike. Deutsche Bank has essentially confessed to manipulating the gold and silver futures markets. It has offered to settle the antitrust lawsuits against it for manipulation for just a little less than $100 million. More importantly, I think the bank has volunteered to provide the antitrust lawsuit plaintiffs with evidence against other bullion banks that participated with the Deutsche Bank traders in the manipulation of the gold and silver markets. And that raises the possibility of all sorts of money that could be due in damages to at least gold and silver futures traders now. Now unfortunately, the U.S. Justice Department is seeking to intervene in the antitrust case in New York to delay further discovery and deposition in the case, so that the government could undertake its own investigation of the rigging – which is pretty ironic since the U.S. Commodities Futures Trading Commission (CFTC) for years, was supposedly doing its own investigation of the silver market and kept saying they couldn't find anything. Now, they want to hold up the civil lawsuit so they (the government) can investigate it. I don't think that the government really wants to investigate the case at all, I think the U.S. government simply wants to delay any further disclosures that would come from discovery and deposition, because they know that eventually, the rigging investigation proceedings like these are going to lead to the U.S. government's own participation. But, anyway, there is now a formal admission by one major international bank, Deutsche Bank, that it helped rig the gold and silver markets, in collusion with other bullion banks. So, that degree of manipulation can't be denied anymore. The other day, I guess last month, a former Deutsche Bank trader was convicted of a criminal violation for rigging the gold and silver futures markets through what's called "spoofing," placing a lot of fake orders that were immediately withdrawn after causing other traders to position themselves in certain ways. So, there's more and more evidence and more and more documentation of this rigging that's coming out. My organization is more interested in evidence of manipulation by governments in central banks, so we're pretty convinced that the bullion banks that are involved in the instance of litigation were most likely functioning as agents of central banks, and making trades on the market that the central banks wanted made in order to suppress prices controlled, prices. But the litigation has not yet gotten around to incriminating governments and central banks. We're hoping that will happen eventually. Mike Gleason: Yeah, certainly if nothing else, the latest developments here with the whole Deutsche Bank case have at least made it known that it's no longer conspiracy theory, it's conspiracy fact as we've been saying for a while now, and at least now everybody is aware of the fact that yes, the markets are actually being rigged. Now Chris, people are finding out that the CFTC is simply a joke. GATA exists at least in part because regulators are completely in the hip pockets of those on Wall Street. In fact, we are learning more through Freedom of Information and Wikileaks about why the futures markets for gold and silver were created in the first place. Our government wanted volatile markets largely to discourage ownership of physical gold and silver. Wikileaks released powerful evidence of that earlier this year. That, and the cozy relationship between regulators and Wall Street explains a lot about why the CFTC could investigate for five years, and somehow miss the fact that banks cheat. We wonder if they were embarrassed when Deutsche Bank admitted to rigging prices while the CFTC investigation took place, turning over 350 pages of documents and some audio recordings to settle a civil suit, helping plans to pursue other banks. So, can we expect regulators to ever do their job, Chris? And if so, can the civil courts hold the bullion banks accountable? Chris Powell: Well you've got to realize, Mike, that what has been happening with gold and silver, the manipulation and the price suppression, is probably completely legal, because the government is doing it. If you go to the U.S. Treasury Department's internet site and find the page for the Exchange Stabilization Fund – which is an agency of the Treasury Department – you'll find that the Treasury Department maintains that under the Gold Reserve Act of 1934, as amended, I think, through the 1970s, the Treasury Department, through the Exchange Stabilization Fund, is fully authorized to trade secretly, and manipulate, and rig any market in the world. Not just in the United States, but any market in the world. I think that, in the end, is why the regulatory agencies have done nothing about the rigging of the gold and silver markets, because it has most likely been done, or most of it most likely has been done at the behest of the U.S. government, which is fully authorized by federal law to rig any market in the world in secret. I'm pretty confident, I mean if I had to bet my life, I would bet my life, that the CFTC knew this when it was investigating the gold market and the silver market, that all signs led back to the government, and the government most likely was using these big investment banks as its agents in manipulating the gold and silver markets, and that the investment banks could just shrug and say, "Hey, we're only doing this as an agent for the government, and the government is fully authorized to do it, so there's no violation by us here." I'd like to call people's attention to that. I'm not privy to every trade that is undertaken by an investment bank or a bullion bank on behalf of the government, but I do know that according to documents filed by a CME Group, which operates all of the major futures markets in the United States, documents CME Group has filed with the Securities and Exchange Commission, and has come out of the Futures Trading Commission that CME Group numbers, governments and central banks, has among its clients in-secret trading of all futures contracts in the United States. And not just financial futures contracts, but commodity futures contracts as well. The CME Group offers a volume discount trading program to governments and central banks for trading futures contracts on all CME Group exchanges. So, we know that governments and central banks are surreptitiously trading all of the major markets in the United States that have futures contracts attached to them. We also know that the gold reserve after 1934 fully authorizes the Exchange Stabilization Fund to rig any market on the planet. I think that's the direction that financial journalism, if we had any, ought to go in. The CFTC and SEC are powerless here, I think, because the law fully authorizes the U.S. government to rig every market on the planet in secret. Mike Gleason: And speaking of that, GATA focuses on manipulation in the metals markets, first and foremost, but these days people legitimately wonder if there are any markets that aren't being rigged in some fashion. I mean, the Federal Reserve has hiked interest rates three times since December. The response in the markets has been a weaker dollar, flat bond yields, and roaring stock markets. Given that the Fed has been tightening, none of these things were expected, but hey, it's sure working out for Janet Yellen and her comrades at the Fed. They are normalizing rates with none of the negative side effects, it's almost like magic. Chris Powell: Yeah, we know that central banks around the world are heavily purchasing various assets… not just government bonds, but they're also purchasing stocks and derivatives and things like that. We know from the CME Group filings with the CFTC and SEC that governments are secretly trading the futures markets in every respect in the United States. And we know from the filings, the annual reports at the Bank for International Settlements and certain statements by central bankers that governments are surreptitiously trading in the gold market and the gold derivatives market, according to a French central banker, nearly on a daily basis. I think there’s documentation that central banks are openly and surreptitiously trading virtually every market in the world here. So, yes, certainly, every major market is manipulated, I think there's whole documentation of that. The problem here, I think, is not so much that any particular market is being manipulated, but rather that the world is losing, or already has lost its free market system. And if you believe as we at GATA do that free markets are a great engine of human progress, then this speaks very poorly about our future. It means we've lost the market economy, that we're transitioning into a totalitarian system. Mike Gleason: That leads me right into my next question here. Some may be listening to this and might be thinking that it doesn't matter, or that what these governments and central banks are doing is in the best interest of the people. But speak to that, and discuss more about why it's in fact harmful, and then who's getting hurt here by this gold suppression scheme specifically? Chris Powell: I would argue that really the whole world is getting hurt by the gold price suppression scheme, because gold is a measure of currencies, it's a measure of asset prices, and if you tamper with the gold price, you're really tampering with every price, because these prices are related. You're distorting the whole world's economy, you're destroying the market system. Now, I don't think you can find examples of history where a totalitarian system, over the long term, achieved great economic progress. I think you can find examples in history where market systems produce the greater prosperity and progress. Well, if we're losing the market system, we're losing economic progress, and we're also losing democracy because people cannot see how prices are being established, they cannot see how power is being allocated in society, and for what purposes? And if you lose the free market system and you lose democracy, I just wonder, what else is there? Mike Gleason: Isn't there a limit to how long price suppression can persist though? I mean, if prices are held lower than a free market would cause for years or even decades, it seems, at some point, shortages would crop up, and prices would shoot up. What are your thoughts on this as we begin to close, do you think we are near such a point in time? Chris Powell: Well yes, theoretically you're right, but that theory has really developed before the age of derivatives. And now, we have this derivative system where infinite supply, at least infinite paper supply of commodities and financial assets can be created with just a few keystrokes on a computer. Eventually, there will be shortages, but not necessarily in the near future. If people, for example, with gold and silver, if investors in the monetary metals are prepared to accept unbacked paper as equivalent of real metal, then I imagine the gold and silver suppression scheme can go on forever. If the metal eventually does run out, as it did run out in March 1968 upon the collapse of the London Gold Pool and then again in 1971 when President Nixon took the United States out of the Bretton Woods agreement. You know, governments can just declare force majeure, they can outlaw the private possession in the monetary metals or try to outlaw them. They can impose capital controls, they can impose windfall profits taxes on monetary metals, investors. There's really no limit to the power of totalitarian governments, or governments that want to engage in totalitarianism. So I make no prediction as to whether or when this system is going to end. I think it's just as likely that it'll grow worse. George Orwell's vision of the future expressed by one of his characters in his novel 1984 was a boot stomping on a human face forever. I hope that's not the future that we're heading for, but I think there's a chance that is unless people around the world are going to stand up for individual liberty and limited government, and accontable government and free markets. Mike Gleason: You certainly have to wonder what may happen if we have another financial collapse, and how many people will actually run to the safety of physical gold and silver. Maybe we have a real divergence between the paper market price and the physical price. I think that's certainly a possibility. Chris Powell: Well, when that day comes, the metal will not be available to people. If they think that there's any chance that the monetary metals will ever be fairly valued, I think you've got to get your metal now, and maybe it'll never be fairly valued, and maybe it will. But when the great reset comes, if it does come, it'll be too late to get your hands on any real metal. Mike Gleason: Yeah, very well put. Well excellent stuff Chris. I want to thank you for your insights today, and for the work you're doing there at GATA. Now before we let you go here, can you give our listeners more information on how they can learn more about this and follow what you're doing there at GATA? Chris Powell: Sure Mike. We've got an internet site, gata.org. We have daily dispatches to our supporters on our mailing list. You can enroll at our internet site to receive our dispatches there. They're free. If you do care for our work, if you take a look at the documentation we've collected on our internet site and the agitation we do, we welcome financial contributions. We are federally-recognized tax-exempt civil rights and educational organization in the United States under Section 501c3 of the U.S. internal revenue code. So, financial contributions to GATA are not just gratefully accepted, but they are tax deductible, and we really do solicit support from metals investors and people who believe in free markets. The mining industry, the monetary metals mining industry now, is so demoralized. I think it’s really cowardly that we can't get too much support from them. So individual investors and supporters of free markets are vital to our continuing. Mike Gleason: Well it's a very noble cause, we certainly appreciate everything you're doing there. We're big fans of those efforts and would love to visit with you again down the road. Thanks very much for your time, and enjoy your weekend Chris. Chris Powell: Thank you Mike. 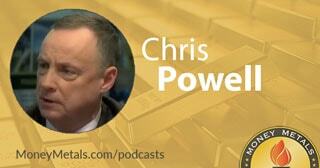 Mike Gleason: Thanks again to Chris Powell at the Gold Antitrust Action Committee. Again, check out gata.org for more information. They publish a lot of great content there at GATA, and we highly recommend everyone check that out. I also want to urge folks to consider going to GATA and making a tax-deductible donation, as Chris just mentioned, to ensure that GATA has the resources to continue this important work. Well that will do it for this week's Market Wrap Podcast. Be sure to check back next week and throughout the year as we look to bring you more great content and exclusive interviews. Until then, this has been Mike Gleason with Money Metals Exchange, thanks for listening, and have a great weekend everybody.